GED Blog » Fostering Economic Integration Through International Trade & Investment » What are the Drivers Behind Economic Globalization? 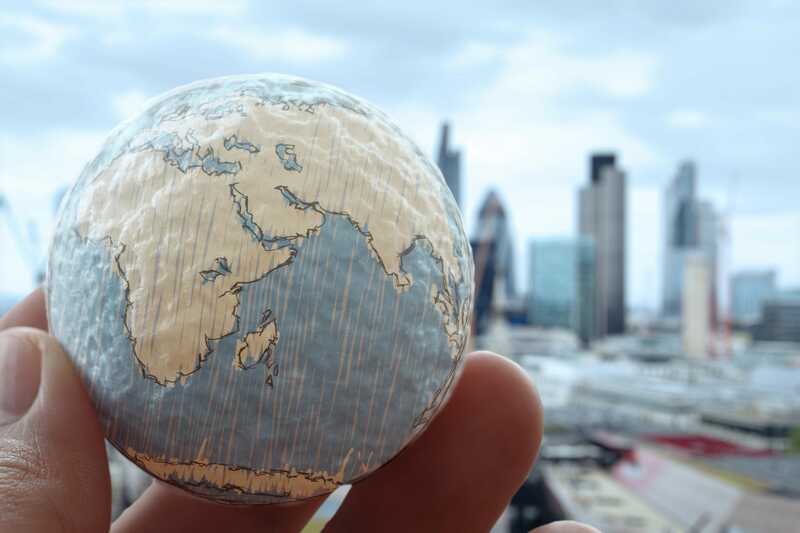 What are the Drivers Behind Economic Globalization? During the last decades we saw a rapid increase of economic globalization. This fact is due to technological progress and different levels of scarcity of resources in individual countries. Sometimes it seems that the increase of cross-border exchange of goods, services, capital and other factors of production is inevitable. But as a matter of fact, the development of globalization is not determined by any laws of nature. Political decisions and institutions are central adjustment screws. Demography: The size of the population of a country is important for factor endowment differences between countries. If a certain economy has a large number of workers but only a small stock of physical capital, the country is labor-abundant and capital-poor. Such a country has an international competitive advantage in manufacturing labor-intensive products. Concerning international division of labor, it will specialize on the production and export of labor-intensive products. Technology: Due to technical progress, costs of transportation and of communication decreased strongly during the last decades. Without these reductions of costs, phenomena such as outsourcing, long-distance trade and global value chains would not be possible. Political decisions: Economic processes are not operating in a political or institutional vacuum. Reducing or even eliminating barriers to trade in goods, services, labor and capital are political decisions. At the end of the day, whether economically motivated cross-border activities do actually take place or not depends on the policy frameworks in place. It is this framework which decides whether cross-border activities are facilitated, made more difficult or even completely forbidden. The decision of a country to reduce import tariffs is essential for the size and structure of international trade in goods and services. Lower barriers in trade increase the incentive to trade with other countries. This decisions is in the hand of the national government respectively parliament. In case of the European Union, these national competences are transferred to the EU. Additional trade policy instruments are bilateral or regional free trade agreements which are used in order to reduce or even eliminate tariff and non-tariff barriers to trade. The conclusion or non-completion of such an agreement is a political decision, too. The same applies to the decision to reduce capital controls which are used by national governments in order to regulate in inflow and outflow of capital. Closely linked to capital controls is the topic of foreign exchange controls respectively the design of foreign exchange markets (fixed versus flexible exchange rates). Finally, immigration regulations of individual countries are an important limitation of international migrations flows. Hence the removal of these restriction, for example within the fundamental freedoms of the European internal market, is supposed to increase cross-border migration between EU-countries. In addition to the shaping of globalization, political decisions are decisive factors for the way society deals with the results of globalization, especially how society wants to correct the market results produced by globalization. 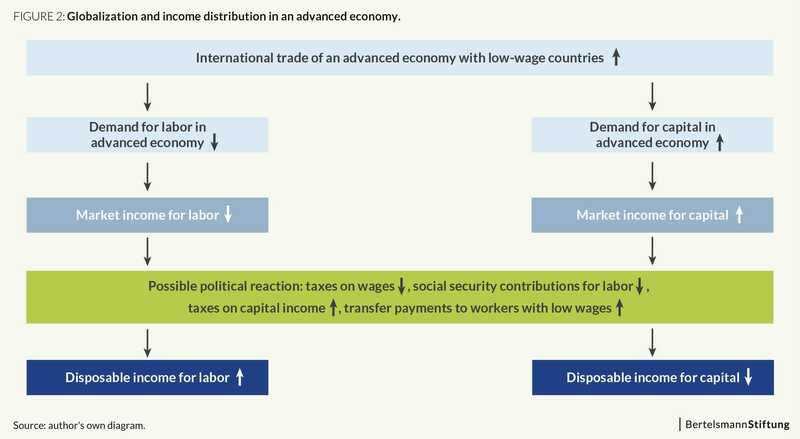 In advanced economies such as the U.S, Germany, France or the United Kingdom, international trade with low-wage countries has negative effects for workers, especially for low-skilled workers. These consequences can be softened by public intervention (see figure 2). For example, if society does not feel comfortable with the distribution of market income due to globalization, taxation and transfer payments can be used in order to achieve a socially desirable distribution of net income. Other institutions which can adjust market outcomes according to preferences of society are the education system, labor market policy tools, all areas of the social security system etc. Therefore, political decisions and institutions decide whether those persons, who suffer from the market processes in a globalized world, are finally the losers of globalization or not. In case of a strong welfare state (extensive redistribution policy, high level of protection against dismissal and more), economic and social policies could compensate the income losses of those persons who lost their job due to international competition. In that case, looking at the disposable income (= market income minus taxes minus social security contribution plus social transfers), these persons might not be classified as ‘losers of globalization’ anymore. However, it must be pointed out that due to increasing globalization, national capacities to manage the consequences of a globalized world are limited. An impressive example of this limitation is Dani Rodrik’s trilemma of the World Economy. Because all markets need institutions, global markets require global rules, too. These rules have to be established on the global level. Hence national self-determination is violated. On the other hand, if national governments have too much power, they will apply rules and institutional arrangements according to the preferences of local population. Since preferences concerning rules and institutions are supposed to differ between countries, the result of national sovereignty is institutional heterogeneity which is not compatible with uniform global standards. Nevertheless, even limited room for maneuvers allows national governments to shape globalization, both its extent and its consequences. If, for example, globalization has gone too far according to the preferences of a country, it is not impossible to turn back some elements of globalization. And even more important: Any government has the possibilities to change the market outcomes of globalization in its own country. The content of this blog post is a modified pre-release of one section of my paper for the “Vision Europe Summit 2017” which will take place on 14 and 15 November 2017 in Turin. You can visit the Summit’s website by clicking here!